Bottle art is both an enjoyable hobby and a creative outlet that produces some amazing works of art that are both beautiful and practical. Considering the green anthem reduce, reuse, and recycle, bottle cutting allows you to focus on the middle portion by finding a new use for a resource that would otherwise be thrown out or recycled. Consider some of the popular projects that can be created by using a bottle cutter and old wine bottles. Mobiles and wind chimes are perhaps the easiest projects to create. More intricate projects might include turning a bottle or jar into a lamp. The reality is that you are only limited by your imagination. Larger bottles can be cut, and hinged to create keep-sake containers, aquariums, terrariums, vases, and almost anything else the mind can think up. Glass etching is the abrading or roughening of a piece of glass in selected areas in order to produce a design. It is a way to produce a “frosted” design on the surface of a piece of glass, but it is much more than that! It can also be used to carve a design deep into the glass or to produce a shaded design that looks like delicate airbrushing but is permanently etched in the glass. 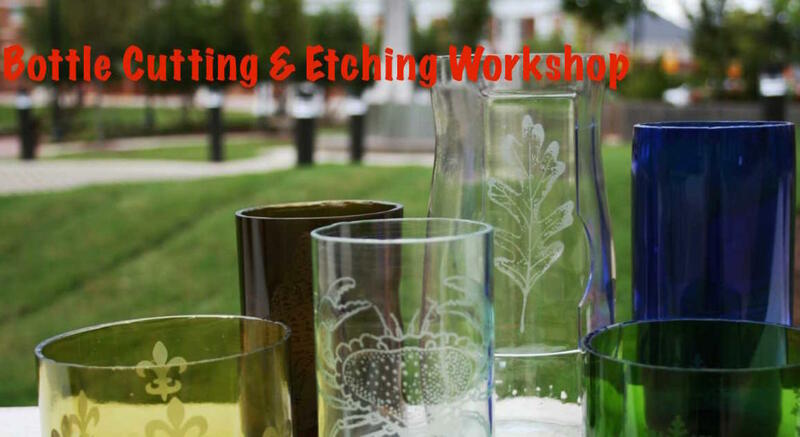 You will upcycle a glass bottle and learn to etch on the same. You can cut as many bottles you want from that technique & make your own wind chime/ jars/ candle holders etc. All the tools & decoration items will be provided in the workshop.